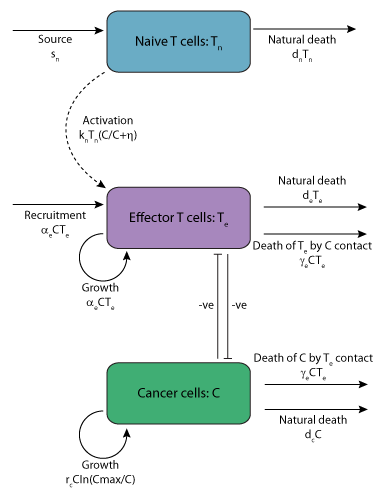 This model runs in OpenCell to recreate the published results. This particular version of the model recreates figure 8 from the paper (where the CML cell count initially decreases but later recovers). The units have been checked and they are consistent. The CellML model also runs in COR however due to the timescale being in days the model is not ideal for simulation in COR. Derived from workspace Moore, Li, 2004 at changeset 0a7eece98f16.